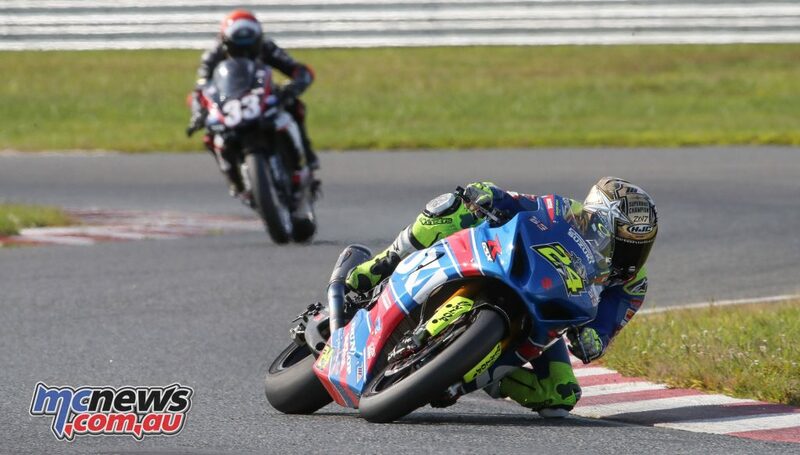 Yoshimura Suzuki’s Toni Elias came from behind to win his 10th Motul Superbike race of the season in race two of the Championship of New Jersey, presented by K&N, a day after wrapping up the 2017 MotoAmerica Superbike Championship. Elias had a more difficult time of it on Sunday as he was struck on the foot with debris on the opening lap that forced him to fall back as far as seventh. Once the pain went away and he regained his composure, Elias did what Elias does and he methodically worked his way back into contention. 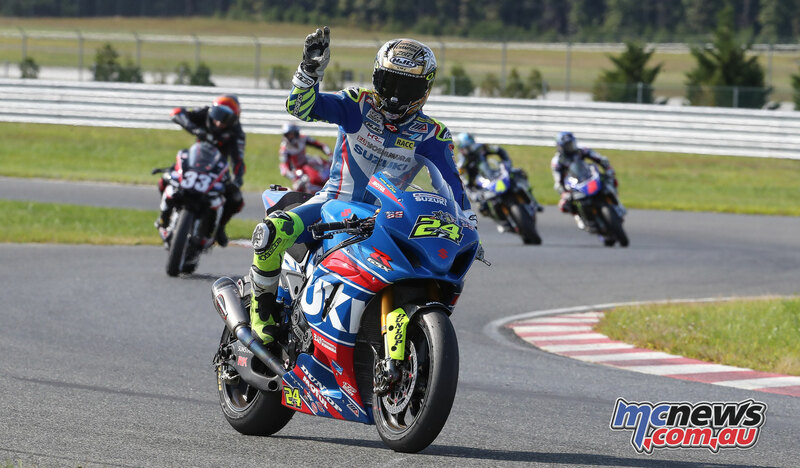 Meanwhile, his Yoshimura Suzuki teammate Roger Hayden was leading the race and holding off the persistent challenge of true privateer Kyle Wyman on the YCRS/Cambr/KWR Yamaha YZF-R1. By the time the race came to the 20th of 23 laps, Elias was there. He passed Wyman and then went after Hayden, passing him going into turn one on the final lap and pushing Hayden wide and off the track. 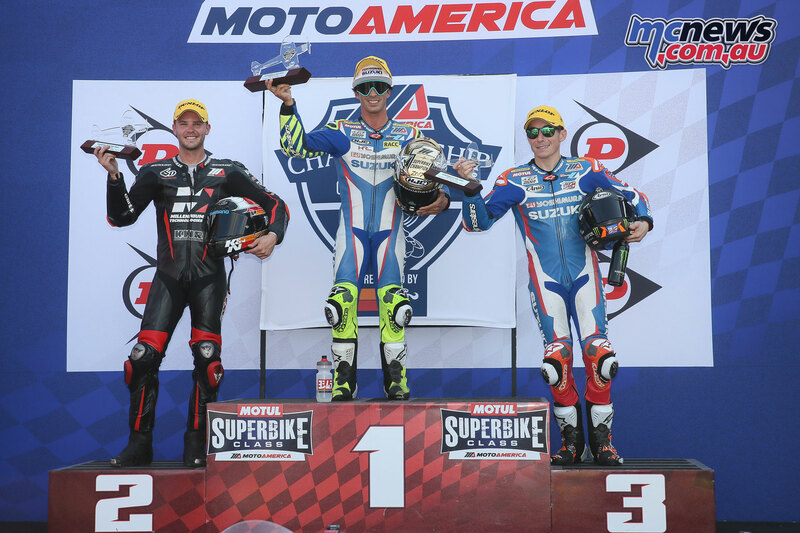 Wyman was the beneficiary of the move and he struck while the iron was hot and took over second, holding the spot to the finish for a career best MotoAmerica Superbike finish. 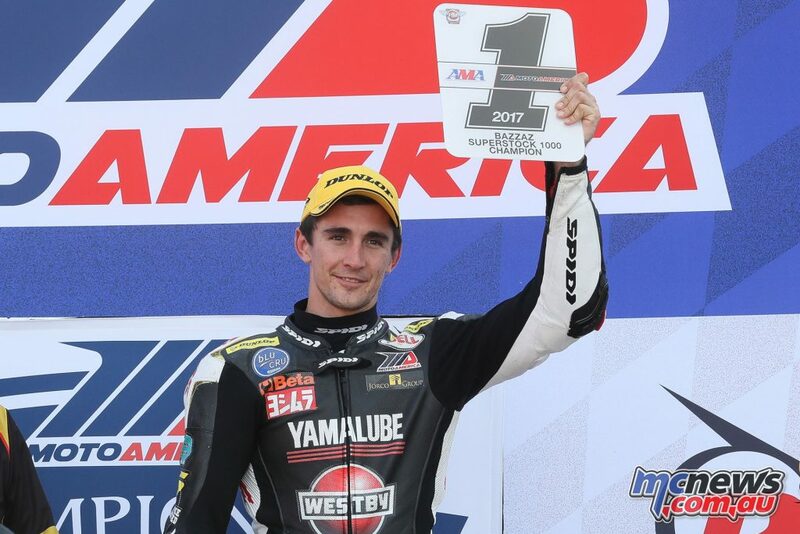 The win for Elias was his 10th of the season and the 16th of his career, which moves him in to a tie for eighth on the all-time AMA Superbike win list with his childhood hero Wayne Rainey, the three-time 500cc World Champion and president of MotoAmerica. Wyman had the race of his life on Sunday, running at the front from start to finish and ultimately taking the runner-up spot when Hayden ran off in turn one on the final lap. It was by far the team owner/rider’s best performance in the Motul Superbike class and it was one that was popular from one end of the paddock to the other. Hayden was forced back to third after being pushed wide by Elias, but he accepted the spot for his 14th podium finish of the season. Broaster Genuine Chicken Honda’s Jake Gagne matched his best finish of the season in fourth place, giving him a 5-4 tally over the two-day Championship of New Jersey. 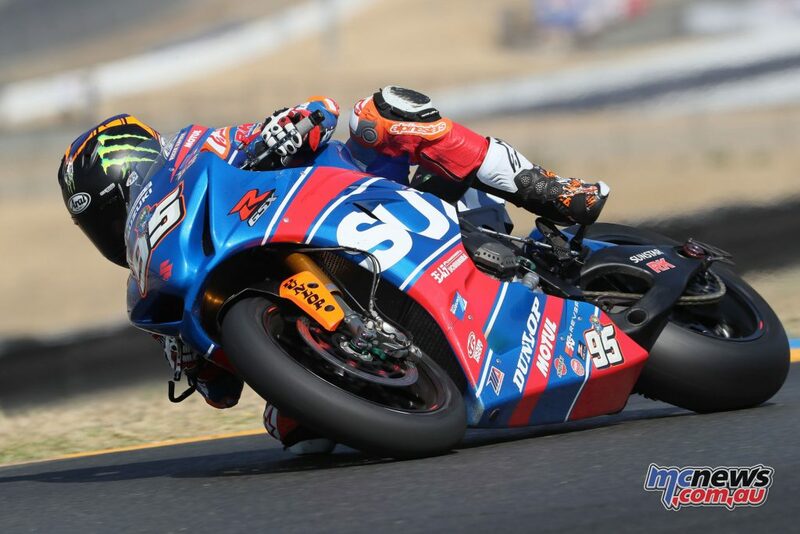 He bested the two Monster Energy/Yamalube/Yamaha Factory Racing duo of Josh Hayes and Josh Herrin, who was filling in for the injured Cameron Beaubier on the team’s YZF-R1. Then came Yamalube/Westby Racing’s Mathew Scholtz, the South African not only taking victory in the Bazzaz Superstock 1000 class but also wrapping up the 2017 MotoAmerica Superstock 1000 Championship in his first full season with team. Quicksilver Latus Racing Kawasaki’s Bobby Fong finished second a day after struggling mightily with handling problems with the ZX-10R. Fong was some six seconds behind Scholtz but nine seconds ahead of yesterday’s class winner Danny Eslick on the TOBC Racing Yamaha. Fly Street/Motul Oils/ADR Motorsports’ Anthony West rounded out the top 10. With his 17th podium finish in 18 starts, Elias leads Hayden by 93 points heading into next weekend’s season finale at Barber Motorsports Park, 390-297. Beaubier, who will also miss the Barber round, is third with 255 points. Like Elias, Scholtz also has a point lead that can’t be beaten as he heads to Barber 75 points clear of M4 ECSTAR Suzuki’s Jake Lewis and 83 points ahead of Fong. 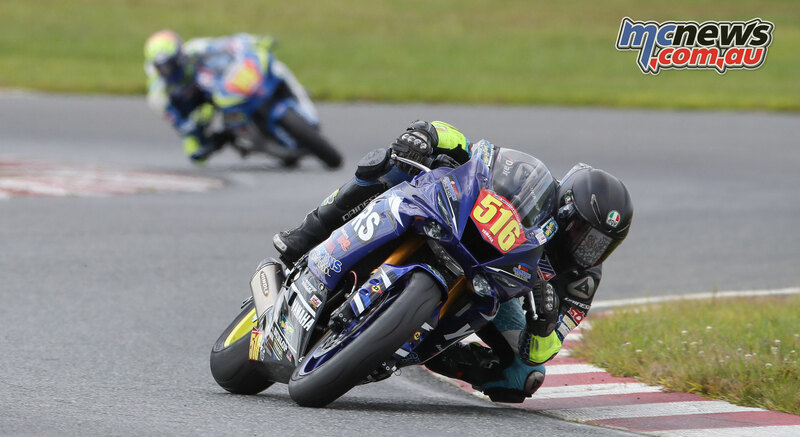 JD Beach is never happy after finishing anywhere other than first, but he was smiling more than normal today after at least coming close to his unmatchable of late teammate Garrett Gerloff in the Supersport race at New Jersey Motorsports Park. 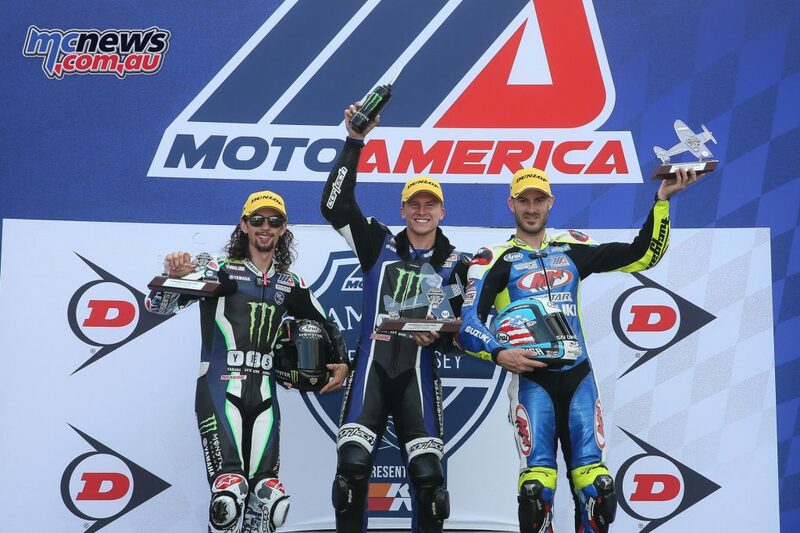 Gerloff took the victory, his 10th of the season and seventh in succession, but this time Beach was only 3.6 seconds behind and felt he might have had something for his Monster Energy/Yamalube/Y.E.S./ Graves Yamaha teammate if he wasn’t baulked by lapped traffic in the closing stages of the race. Third place went to M4 ECSTAR Suzuki’s Valentin Debise after an early race battle with Benny Solis on the Team H35 Honda CBR600RR. 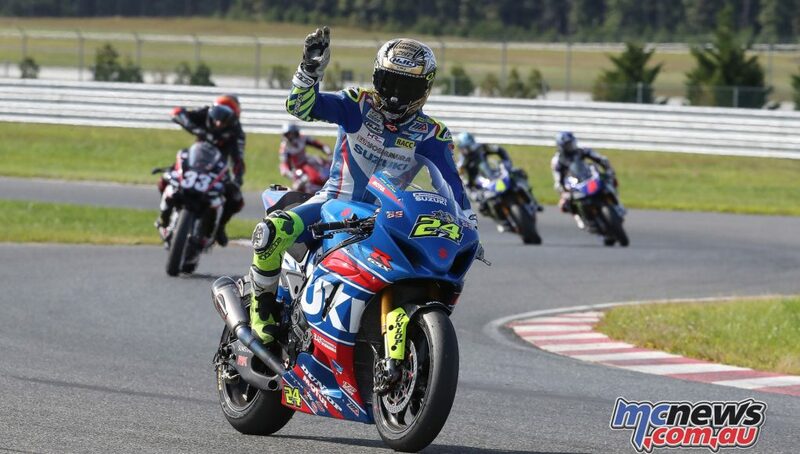 With Beach finishing second to Gerloff, it means the Texan will have to wait until next week and Barber Motorsports Park to wrap up his second straight Supersport Championship. Gerloff leads Beach by 46 points with the two races remaining in the Barber finale. Debise, meanwhile, is third and 27 points ahead of Solis. 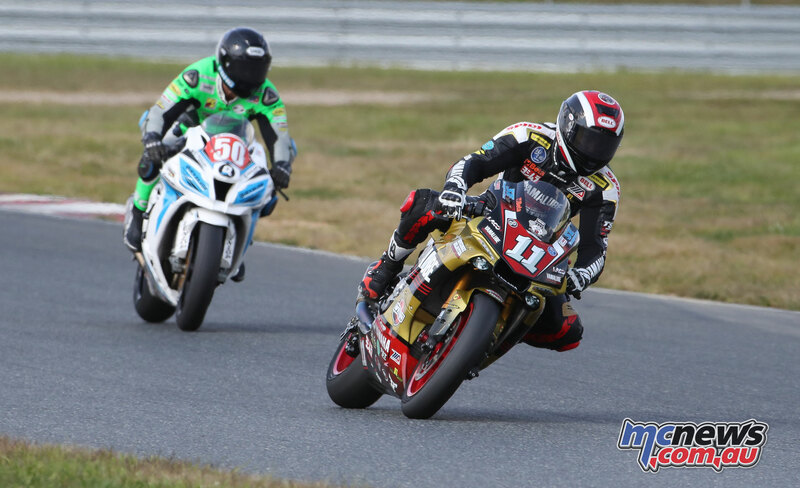 The real championship battle is in the Superstock 600 class. With Anthony Mazziotto III and his YCRS/Mazziotto Racing Yamaha winning Sunday’s race, the battle for the championship tightened to just three points as Team MG55’s Michael Gilbert bested championship leader Jason Aguilar by one position – fourth to fifth – to move to within three points, 250-247, with just the two races at Barber remaining. 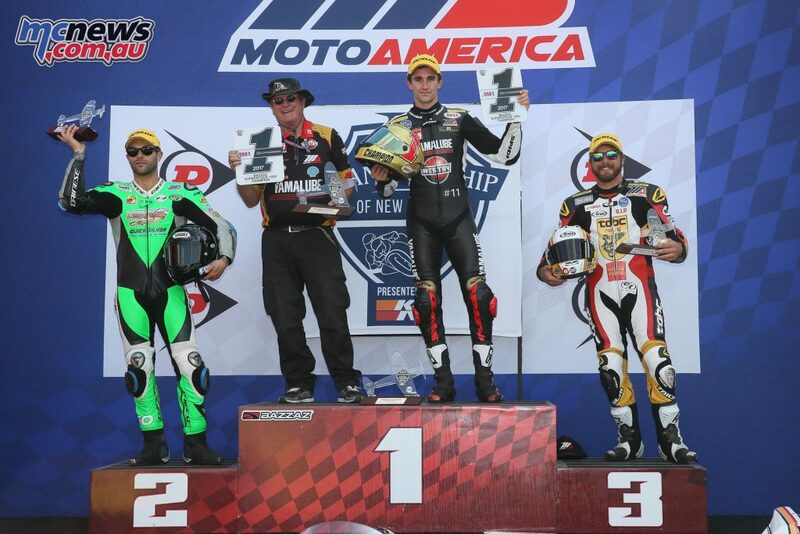 M4 medAge Suzuki’s Nick McFadden finished second to Mazziotto in the race with Tuned Racing’s Braeden Ortt rounding out the podium in third. Three riders, one point. 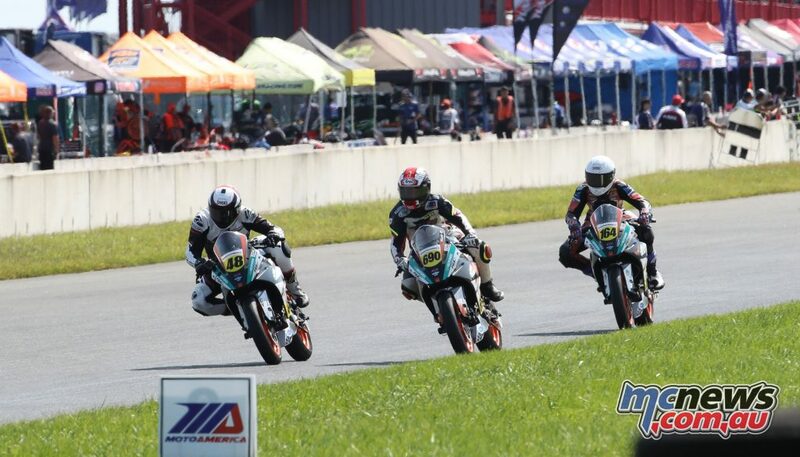 That’s the championship situation going into next week’s final round of the 2017 MotoAmerica KTM RC Cup at Barber Motorsports Park as Benjamin Smith and Cory Ventura are tied for the lead in the championship with Alex Dumas just a point behind in third. 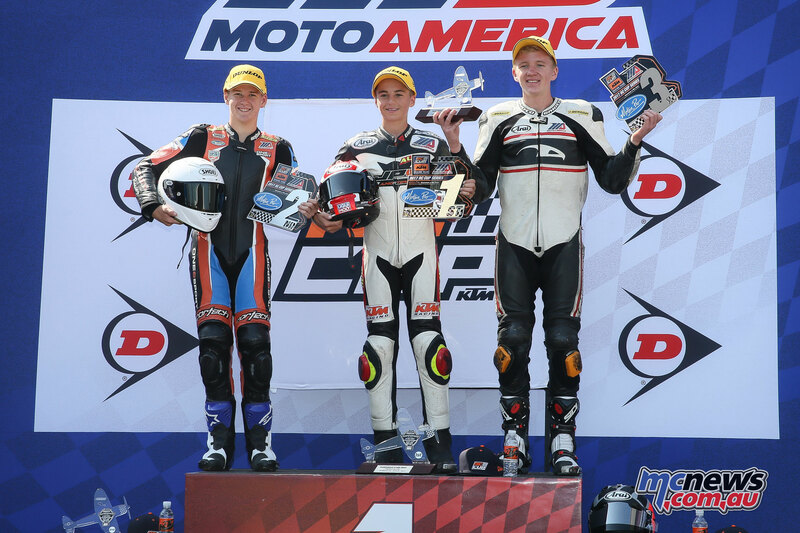 It was Dumas who gained the most this weekend in New Jersey, the French Canadian and his JP43 Junior Team RC390 winning both races to pull to within a point of Smith and Ventura. Dumas won on Saturday and he won again on Sunday, again beating Ventura by a scant .145 of a second. Smith, after crashing out of yesterday’s race, finished third, some four seconds behind. With just the two races remaining, Smith and Ventura are tied with 224 points and Dumas, with his fourth win in a row, is third with 223 points. The title will be decided next week in Alabama.